I am excited. 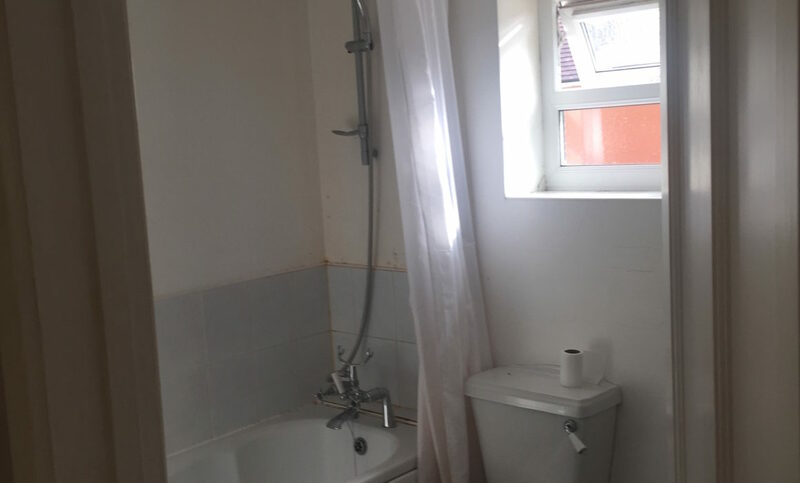 My bathroom, with its damp walls and grim tiles is no more. It has gone, and evolving is a much more luxurious space. 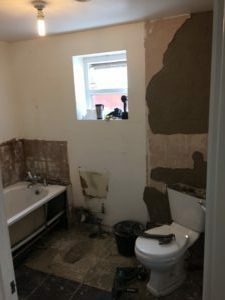 I bought this property as a bit of a project, but it turns out running a business and looking after two small children takes up quite a bit of time, so it has had to be put on the back burner for a while! But now it has begun in full force, starting with the bathroom which is the room which was really crying out for some attention. What I wanted when planning this room was a space which would be practical yet relaxing, with much better light and storage. 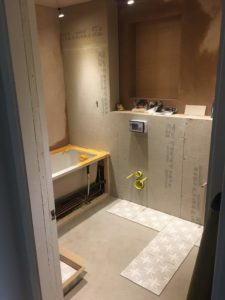 Previously there was a separate shower squashed into the right hand corner, and as it is a small room I made the decision to put the shower over the bath to make room for a wall hung vanity unit to make the room feel more spacious. Already the bathroom has begun to take shape. The window has been enlarged letting in more natural light. Boxing has been installed behind the shower and under the window for the concealed cistern for the wall hung WC, providing a useful shelf. Gone is the single central pendant light, and instead downlights have been installed and positioned so that they shine directly onto the sanitaryware, bouncing light back into the room. I have also place an angled downlight in front of the towel rail to light the towels, highlighting their texture to bring a softness to an otherwise hard space. This is a trick often used in hotels to give the bathroom a more luxurious feel. Wall tiles are going on tomorrow. This time next week it should be complete! Watch this space….